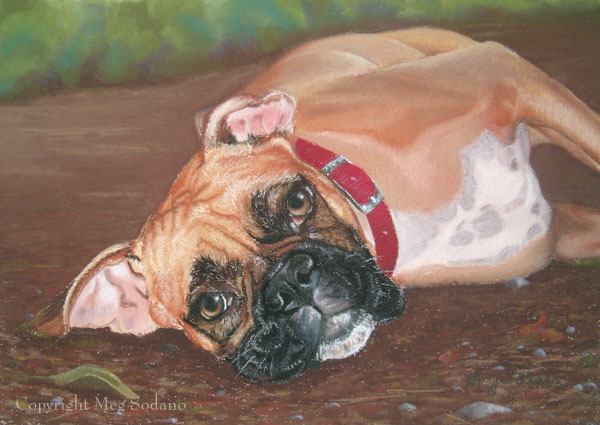 Custom dog and cat portraits in pastel and watercolor. Art and content © 2019 Meg Sodano. This pose clearly illustrates Tank’s laid-back attitude. He is a very affectionate dog, always leaning against or cuddling with his people. 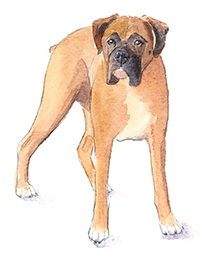 In this portrait his most endearing features are accentuated: his big brown eyes, wrinkly forehead, and spotted chest. "You captured the essence of her - the gentleness in her eyes and mannerisms, and her willingness and readiness to play." "All the details, the sweet expression, everything is so perfect." "Viewing the portrait many times a day always makes my heart smile."